Grant travels to western Canada for a conversation with Pan American Silver Chairman, Canadian Mining Hall of Fame inductee, and Order of Canada recipient Ross Beaty. 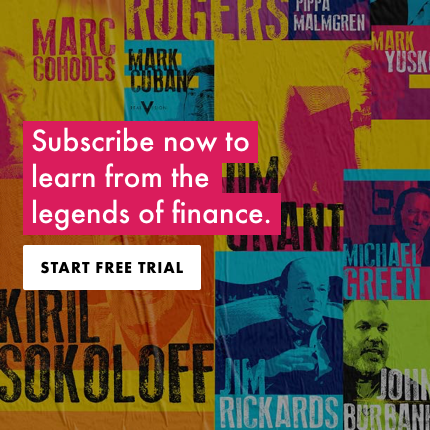 The two discuss Ross’s extraordinary career as a serial entrepreneur across multiple different resources, and pick apart the successes and failures that have shaped one of the most successful mining executives of the last half century. Ross describes his successful ventures in silver, gold, copper, and alternative energy, and explains his deep philanthropic commitment to the environment, in a fascinating and engaging conversation. Filmed on July 23, 2018 in Bowen Island, British Columbia. I don't believe in the "lucky gene pool" theory - it's not some random luck of allocation where in the world we are born; we are the products of our ancestors and the choices they made. And our children's lives will be shaped by the choices WE make. Ross here, may have been born in Vancouver during a boom but he could easily have chosen the life of a drunk and spent his life wasting away in hedonism... but he didn't. He made smart choices and his progeny will benefit as a result - this isn't luck... it's standing on the shoulders of the giants who came before. Yet another magnificent piece by Mr Williams. I just can't believe the quality of conversation he continually is able to get from people. Bravo, well done and thank you for letting me sit over your shoulder once again. I suggest making an interview with the Australian mining prospector: Mark Creasy, if possible. Thanks again. Great interview.. Thanks Grant ... Looking for more in near future. "Yep", "Right"....sorry Grant. Not sure how your interjections help the interview. Excellent interview and great content - I could have watched another 90 minutes. Think it’s orca gold. Glad if someone could confirm it. JR - Ross owns 8.13%. Earlier this year he bought a further 1.25m shares. The Company is focused on the acquisition and exploration of mineral properties in Africa. Its exploration focus is on the Arabian Nubian Shield in the north of Sudan, where it holds the Block 14 prospecting license. Its property is located close to the Egyptian border, approximately 700 kilometers north of Khartoum and over 300 Kilometers west of the Red Sea. Great work RV! Thank you. Omg. That property was majestic. Great interview. great interview. I had the pleasure to meet Mr Beaty a couple of times and true to word fell for his charming sales pitch, in my case Pan American Silver and Equinox Gold (at higher prices...). But seeing this interview, it makes perfect sense why he/Equinox Gold bought the asset from New Gold last week. He is betting again on the cyclicality of the gold price and time will be on his side. Given how much money New Gold had to write off for this asset (or how "cheap" Equinox could buy it) is telling of his business smarts. This gives me comfort that in the end, his last "hurrah" Equinox Gold as he stated it himself will eventually do well. I guess what differentiates him to many other mining executives is the humble and non-arrogant manner/talk and execution of a business plan. Too many others are just in for the "get rich quick" scheme which may partly explain why the sector has such a bad reputation. A few more the likes of Ross Beaty, Sean Boyd or Mark Bristow would do the sector a great favor. Great interview! Wondering what Ross's view of the pebble creek mine project in Alaska are given his environmental stewardship. Thanks Ross and Grant for a great interview, it was truly inspirational on so many levels and I enjoyed every minute. Thanks a lot Ross and Grant! This was a fantastic conversation in a wonderful setting. It's great to have interviews like this with successful entrepreneurs. Ross's life story is instructive, very entertaining and inspiring, and there's so much to admire about his career and his philanthropy. About half way into this interview he mentions a trip south to look at a mining property - I'm guessing that was New Gold's Mesquite mine in southern California - which Equinox acquired last week. Looking at the details of that deal and how well it fits with Equinox's other mine in that area, it's clear that Ross is as shrewd as ever... Bravo Grant for another perfect interview. In a world of soundbites and tweets it's great to have these lengthy interviews with real substance. your in depth interviews are always excellent. this one is beyond that. A masterclass in resource investing. Pair Ross's interview with Tony Deden's lessons in capital preservation and you have the best survival guide available. It is one the best interviews I've ever watched in RV. Although Mr. Beaty says he owed much of success to LUCK, but I believe that his enormous work accumulated with the experienced knowledge brought him this stupendous career. So I can say that this gentleman validates the meaning of LUCK as "Laboring Under Correct Knowledge"! Grant, by the way, we will be needing a documentary on the global trade war that the US has started and how it will affect us all. I know it will be great! Cheers!! Ross Beaty should write a book of the world of mining and all the adventure and danger he has experienced! I am sure it would be a great read! Thanks guys. Another great interview from Real Vision!! Just brilliant. Sheer inspiration. Grant Williams is the best interviewer of our time. Everyday I look forward to the next in depth discussion. So many life long lessons to take away from these mini autobiographies. Great discussion. I think this was most enjoyable and informative and has calmed some of my anxiety with the mining sector. I loved the interview, but was frustrated by the fact that Grant didn't ask Beaty what made him so confident in his forecast for new all time highs in the price of gold. In an industry filled with promoters, frauds, and perma-bulls, Beaty shows a rare integrity, and therefore when he makes a statement like: "we know gold is going way beyond it's all time highs of 2011" it is worth exploring. This video went on for 90 minutes, spent lots on production, but came up short because it didn't ask a very credible person why he felt so confident about gold's future price-- and for that I would have traded images a hundred shimmering lakes. But Chris...he did say why he thought gold would soar. It's cyclical. Think about it...in 1982 The Dow was at 680 or whatever and now? 26,000+. In 1971, gold was 35 and peaked 10 years later at $800. Get my point? Same can be said for interest rates as well. In any case don't blame Grant for asking a question that had already been answered. Ross is talking inside-baseball when the gold price issue comes up. He thus left out stuff that many who follow the industry take for granted. Eg. Ordinary long-term commodity cycle fluctuations typically see price swings of 50% - 100% and often more (see oil, copper and uranium prices etc....). However the implicit monetary nature of gold suggests that it could do even better. BTW nice to see RV has inked a product placement deal with Mercedes. (The one they had with Kia must have expired). Grant probably asked fewer questions in this 90-minute interview than any of the much shorter ones he's done for RV, but then he didn't really need to say much. Beaty's enthusiasm is inspiring and infectious; he obviously loves sharing his great love for the resource business, environment, and life in general. He's one of my favorite CEOs, and it was great having him sit down with my favorite interviewer. Another spectacular interview Grant. I enjoyed every minute. Thanks so much. You need to pace your interviewees. It's clear this guy got tired, and was having to push. Fantastic interview! Grant alone can outdo himself! If only every interviewer just had the patience to listen rather than keep interrupting their guest just to get through their list of questions/notes. This is great content and well done by Grant and Ross. Thank you! Excellent. Thank you, Ross and Grant. At the end of the day, we like do business with or invest in people we like and trust. Ross checks those boxes and has a fantastic track record. Glad to be a current shareholder in Equinox Gold. What a refreshingly uplifting interview! Ross Beaty is such a breath of fresh air in a commercial world that is all so often populated by greed and a disregard for honest endeavour or moral values! So great to hear the life story of a gifted entrepreneur who also possesses rare humility. His enthusiasm for life is so infectious. Listening to Ross and Grant in conversation has already made my weekend! Great interview Grant and Ross. Thank you for sharing your time. A wealth of knowledge, a healthy helping of common sense, and a reminder that persistence married to frugality, morality, and merit can and will payoff in the end. That is a message that refreshes the soul of entrepreneur and investor alike. What is wrong with Katusa? I have only started following him a couple of month ago but like it so far. Hey Markettaker— For you and all the haters who may not like my style—Why don’t you ask Grant who introduced him to the resource Titans that the RV crowd has enjoyed over the last few years? I did so because early on I supported Raoul and Grants vision of sharing knowledge of the resource sector to the masses who want to learn. . More importantly—my track record is very open for all to see. I also don’t hide behind a wall like a troll. Another question to ask yourself while you are trolling along—“why are so many of the biggest names in the resource sector partners with Katusa in long term deals?” I’ll leave it at that and you will enjoy my next RV as I will address so many misconceptions of the resource industry. Great guy who has lead a magnificent life. A privilege to be able to listen to his life story.